Run a half marathon this August. Strava is challenging you to run a half marathon as fast as you can. 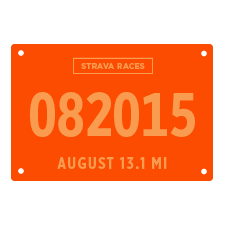 Unlike a typical half marathon, tackle this Challenge from any location, at any time of day. Skip the travel and the pre-dawn alarm clock. Don't skip the chance to push yourself, and the pace. Just pick a safe stretch of road or trail, record an activity that is at least 13.1 miles (21.1 km) long, and embrace the effort.